The Silks are a rare breed. 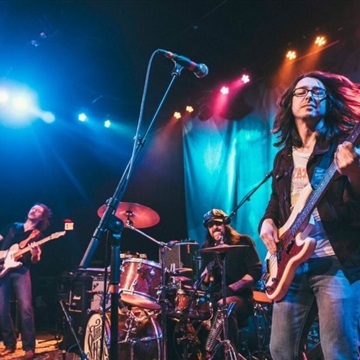 The Providence, RI-based trio have been known to tear up the stage with a Southern rock fury one minute then silence the crowd with some fine country pickin’ the next minute. In anticipation of the forthcoming new studio release, we’re pleased to share a special six-song sampler of music both old and new. “Let It Ride,” the lead single from the band's forthcoming album, is vintage The Silks. The growl of singer-guitarist Tyler-James Kelly’s voice rivals that of his guitar while the ace rhythm section of Jonas Parmalee and Uncle Sam Jodrey sweeten the sound with some fine honeyed harmonies. The sampler also includes a special pair of (mostly) acoustic tracks recorded live during a One-on-One Session at the 2014 Outlaw Roadshow in NYC. “Home” was ultimately recorded in full-on electric glory for the new album while a studio version of “Make It Easy” remains unreleased. Rounding out Roughhousin’ with The Silks are a trio of fan favorites from Last American Band, their Paul Westerberg-produced debut release. For those not previously familiar with The Silks, these three tracks are a mighty fine place to start. So grab your beverage of choice and give Roughhousin’ with The Silks a listen. And, by all means play it loud. The Silks are Tyler-James Kelly, Jonas Parmelee and Uncle Sam Jodrey. Performance photo courtesy of Lauryn Sophia Photography. Couch photo courtesy of Joan Hathaway Photography.